Our Client, Jamaica Cottage Shop, Inc, builds and sells fine post and beam garden buildings like tool sheds, cottages, wood sheds, and more. 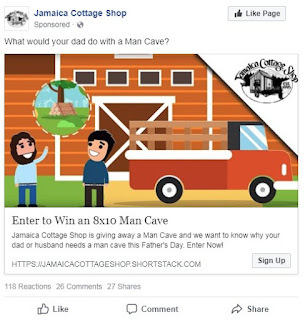 Beginning in February of 2018, they began a contest, hosted through the platform ShortStack, to Win a 8X10 NewYorker Shed from Jamaica Cottage Shop for a deserving dad or husband this Father’s Day! The contest will run through the end of May, and one lucky winner will be chosen to surprise the guy in their life! 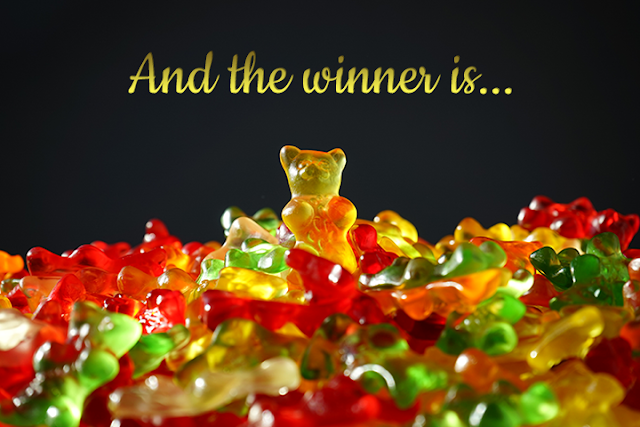 This contest landing page was built through ShortStack and advertised through Facebook. Facebook users are targeted Ads based on search criteria, interests, demographics, and more. 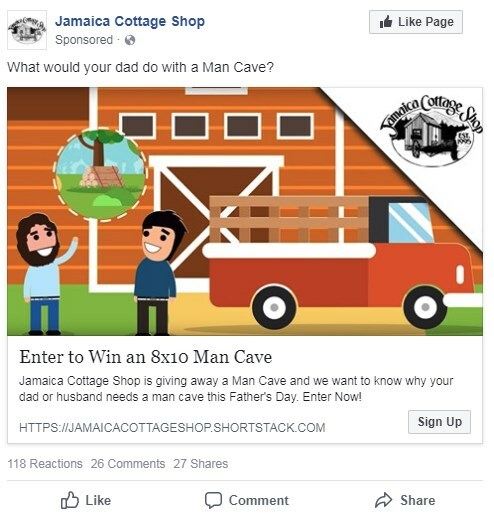 Once the user sees the ad and clicks on it, it brings them to the contest landing page where they either enter a description or photo about why their dad or husband should win. As well, users enter their email to expand Jamaica Cottage Shop’s email list. We ran 4 ads to A/B test. The ads and results thus far are explained below, from lowest performing to highest. 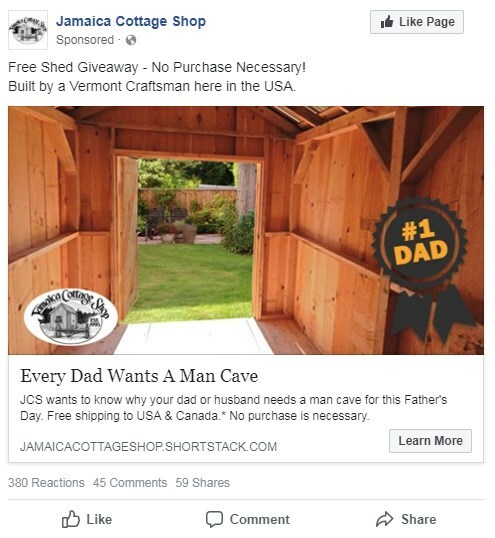 “What would your dad do with a Man Cave?” So far, this ad has received 466 Link Clicks to the Landing Page. It has a CTR (Click-Thru-Rate) of 3.55% and a CPC (Cost Per Click) of $0.15. The image shows cartoon characters discussing the lumber used to build the shed, with mention of the contest in the description below the image headline. “Free Shed Giveaway - No Purchase Necessary! Built by a Vermont Craftsman here in the USA.” The Shed Ad has received 1,179 Link Clicks to the Landing Page. It has a CTR of 3.61% and a CPC of $0.18. In this ad, the giveaway is mentioned in both the newsfeed description and the link description. The ad hints at the father’s day theme with “#1 dad”. “Man Cave or She Shed?” This ad has received 2,172 Link Clicks to the Landing Page. It has a CTR of 4.50% and a CPC of $0.16. Back to the cartoon characters, but it can’t be all about Dad, what about those women who deserve a “She Shed”? The newsfeed description brings in the deserving women, as well. “Enter to win an 8x10 Post & Beam Shed from Jamaica Cottage Shop built by a Vermont Craftsman here in the USA.” The best performing ad mentioned the “Father’s Day Giveaway” in the image. This ad has received 6,123 Link Clicks to the Landing Page. It has a CTR of 4.91% and a CPC of $0.15. This ad shows it’s all about dad! The image highlights this loud and clear while the supporting text below explains the giveaway. 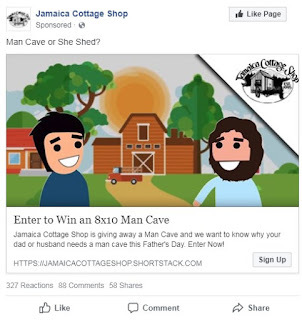 The newsfeed text explains Jamaica Cottage Shop and their buildings. 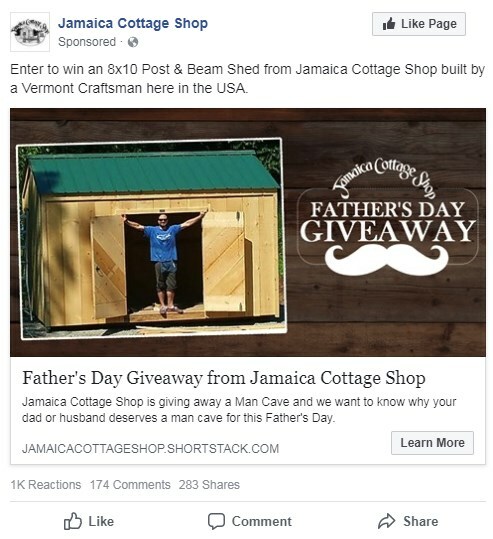 As of now, the Jamaica Cottage Shop Father’s Day Giveaway Contest has received over 1,400 entries... that means 1,400 more emails to add to their email list and 1,400 more potential customers, at slightly over a $1.00 cost per lead and a 14.27% Conversion Rate. The contest has been running for about 2 months, with a little over one month remaining. We estimate the leads to amount close to, if not exceed, 2,000. Interested in winning this shed? 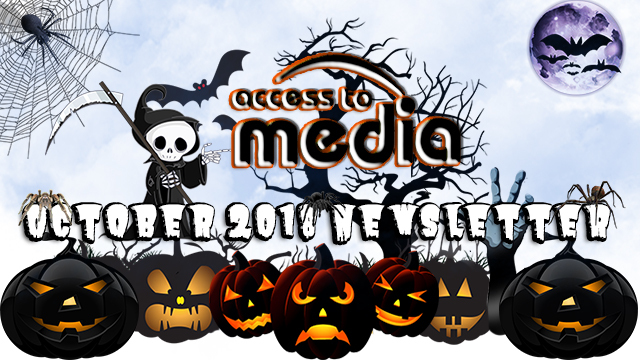 You can enter the contest HERE!